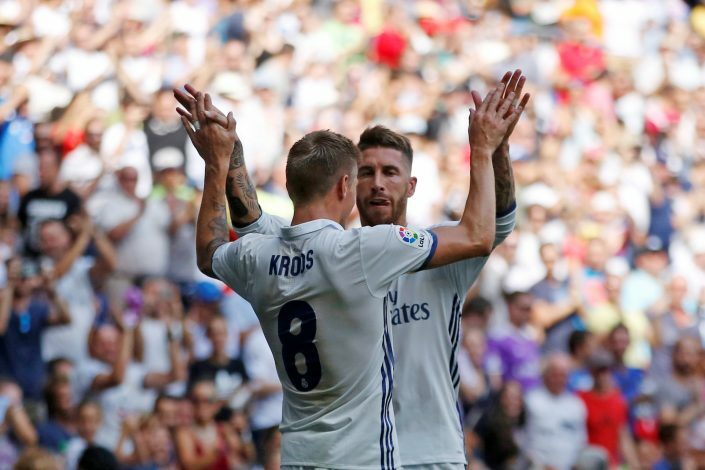 Real Madrid’s Toni Kroos has vehemently denied he would ever make a switch to fierce rivals Barcelona, whilst also hinting that he may retire early from football. The German international has dismissed speculation that he would be willing to move to his current team’s fiercest rivals, saying some moves should never be made and that it would be an insult to the fans and to his current team if he did such a thing. “I do not envisage going to Barcelona. There are certain transfers you simply don’t do. This has a lot to do with respect. Respect for tradition and the fans,” Kroos told Kicker. Kroos joined Real Madrid in 2014 after being a runaway success at German heavyweights Bayern Munich, and right after winning the World Cup with Germany. Ever since his arrival, he has been a permanent presence in Real’s midfield, and one of the first names on the team sheet. Surprisingly, however, Kroos seemed to suggest that he has signed his last contract. The German recently put pen to paper on a six year contract rumoured to be around £108 million. “I will have reached 32 at the end of the contract. I do not forecast playing until 38 or 39. While he did say that he wouldn’t predict what would happen between now and six years later, it seems likely that this would be his last contract, and the Germany international would retire afterwards. However, it would be too soon to say for sure, considering football players change their minds frequently, and it wouldn’t be too audacious to suggest that Kroos would indeed be playing until he reaches 35.